Each time you post an article or a link that promotes one of your products, services, or articles, you’re being self-promotional. If everything you’re sharing on social is about you, then your trust with your followers will decline. Now let’s cover how to build your authority, helpfulness, and intimacy, and how to do self-promotion the right way. Be an authority by being a part of the conversation. That means monitoring the latest happenings in your industry and sharing your insights and opinions. To be an authoritative commentator, you can’t just be responsive to questions, but you must be proactive about joining them too. Find conversations about your industry and offer your insights. Share your opinions, and provide helpful articles. To find conversations to join, monitor keywords and hashtags, as well as discussions, such as those occurring in LinkedIn groups. Look at your Google Analytics account and see what keyword searches people are performing before they end up on your site. Monitor those keywords on social—chances are, people are talking about it on their social channels, too. RSS blog feeds: Actively follow what your partners, competitors, and others in the industry are sharing, so you can stay on top of the latest news, and share your findings. Hashtags and keywords: Follow keywords and hashtags that are relevant to your industry. You’ll be able to see what others are sharing that relates to those topics. Buzzsumo: With Buzzsumo, you can search by topic and see what type of content is most shared on that topic. 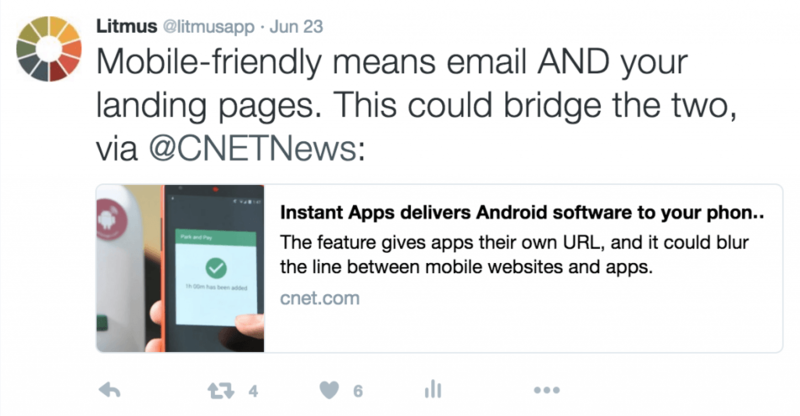 When you’re sharing a third-party article, credit them in your tweet, Facebook post, etc. This not only shows that you aren’t just promoting your own content, but it also helps build a relationship with the brands and people whose articles you’re sharing. Part of being an authority in your space requires that you also create your own helpful content. By monitoring hashtags and keywords, you can see what questions are asked frequently, as well as what topics are most popular. Use those as content inspiration. When it comes time to writing, a few of my favorite resources are Convince & Convert’s Content Marketing blog, Ann Handley, and the Content Marketing Institute. To create the helpfulness part of your trust score, you should be responding to almost every tweet about you. In order to respond to people, you need to actively monitor your social media platforms for mentions. In addition, monitor for the name of your company, products, services, and URLs, too. Over 30 percent of tweets don’t include a Twitter handle when mentioning a company, so you’ll miss out on a lot of conversations if you’re only monitoring your handle. Tools like Sprout Social, Mention, and Hootsuite are great for monitoring all of the different variations of your handle. While you should answer all questions you can on social, it’s not possible all the time. Not everything can be solved in 140 characters or less, and oftentimes, those that are handling your social media account may not be very technical or aware of issues with your tool. 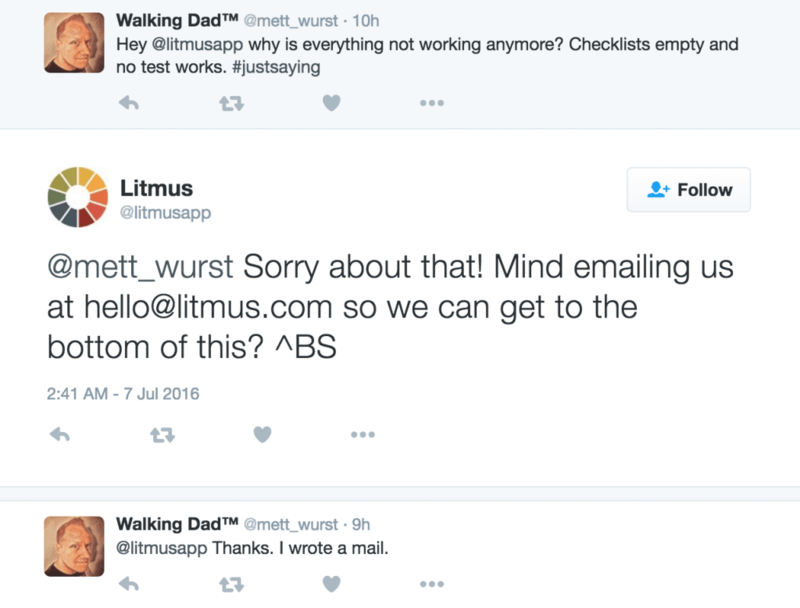 That’s okay—direct people to a more appropriate channel like a customer support email address or phone number. You’re still being helpful by redirecting them to a platform where they’ll get their question answered quickly and efficiently. When you’re responding to questions, do it quickly. 65 percent of social consumers expect a response in under two hours on Twitter. The reality is that only 20 percent of brands are responding within that timeframe. And when you don’t meet your followers’ expectations, negative actions can occur. 60 percent of consumers say they will take a negative action if they don’t receive a timely response on social, including buying less, complaining on social, and telling their family and friends about it. Conversely, when you respond quickly and meet your followers’ expectations, there are many positive benefits that can occur, including: 47 percent will recommend you on social, 43 percent will encourage others to buy from you, and 34 percent will buy more from you. So when you respond, do it quickly! Unless you’re a global brand with a whole team dedicated to social media, it’s not realistic that you’re online and able to monitor social media at all hours of the day. And that’s okay! But if this is the case, it’s necessary to set expectations with your followers. Do not post on social media during times of the day when you’re not able to respond. This sets the wrong expectations. It’s like seeing a store with a bright neon sign that says “OPEN,” but when you get to the door, it’s locked—you see what they’re putting out there, but you can’t interact with them at all. Only promote content on social when you’re online. The key to building intimacy with your followers is showing that you’re human. People want to interact with other people, not companies. Your followers aren’t interacting with robots on social media—they’re interacting with people. Show them this. This helps them identify with your brand and build relationships. 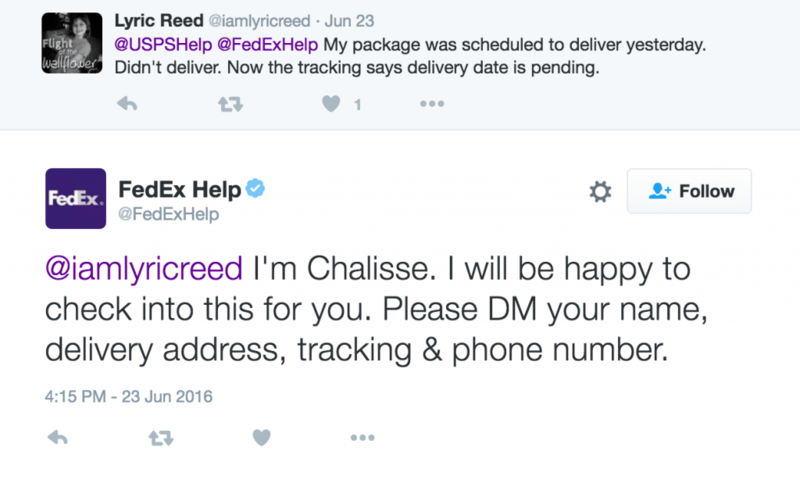 FedEx does a great job of this. In this example, Chalisse clearly identifies herself as the person Lyric is interacting with. She’s helpful and friendly, which helps build brand trust. Lyric is likely to reach out on Twitter again if she has another issue because she knows they’ll be responsive. 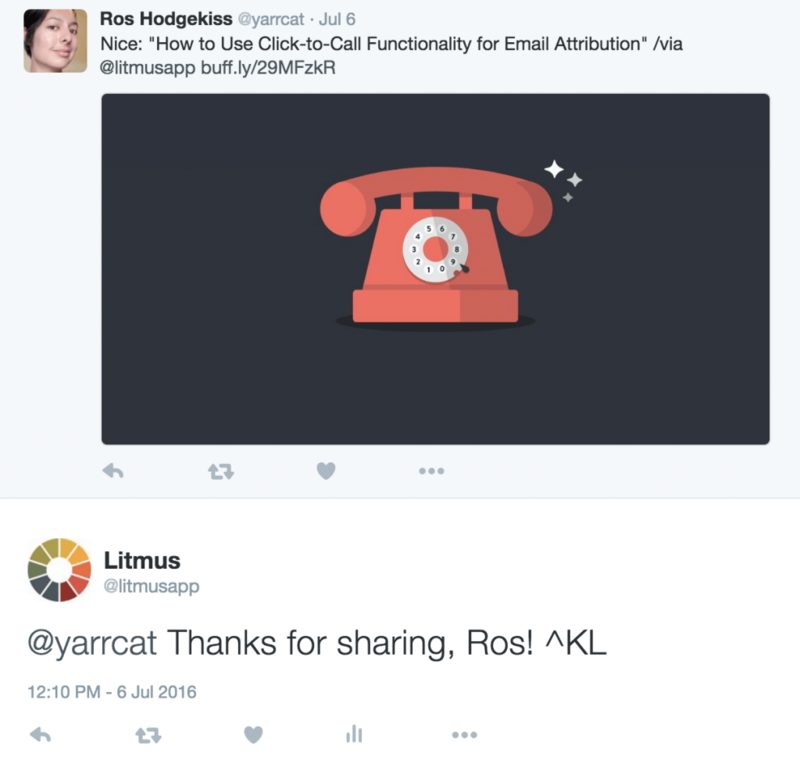 At Litmus, we do something very similar on Twitter to show that there are actual people behind the @litmusapp handle. 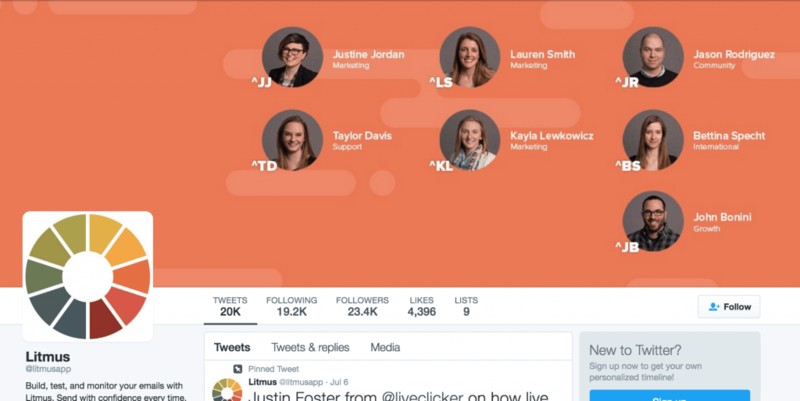 We include the headshots, names, and departments of everyone who tweets in our Twitter header image. When interacting with followers, we use our initials that are clearly identified in the header to sign our tweets. This helps our followers know exactly who they’re interacting with—and they even respond to tweets with our names in their response! Immediately, an influx of tweets came in, pointing out my errors. This was a simple mistake that didn’t offend anyone, so it was appropriate to handle this issue with humor and admit my mistakes. It shows that I’m a human! However, for brands that make big, offensive mistakes, bigger actions should be taken—for example, deleting the post, responding to anyone that was offended, issuing an apology, and maybe even reaching out to your PR or legal teams. 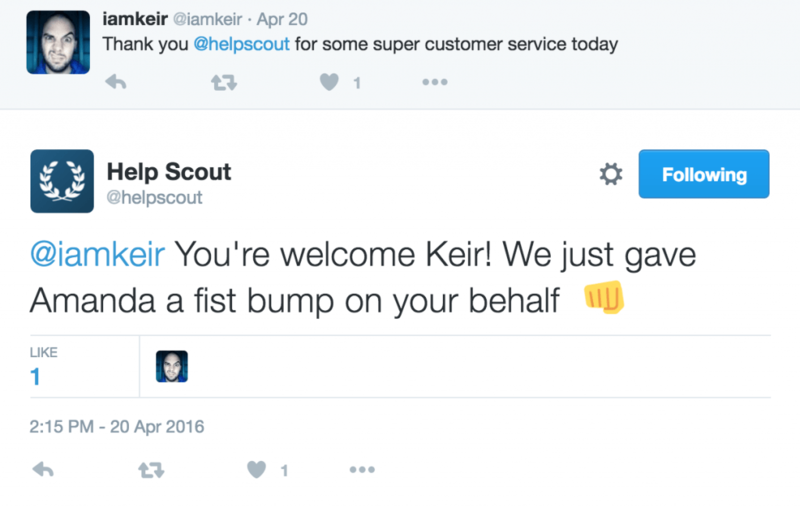 Not only does HelpScout they show their playfulness and brand personality by giving a fist bump and including a fun emoji, but they really personalized the tweet. They went into Keir’s help ticket and found the support person who Keir interacted with, and included her name in the response. Talk about adding a human element to the response! Prove that you’re human. Answer questions, join conversations, and share your insights. It’s the people behind the companies that are helpful and actionable, not the companies themselves. 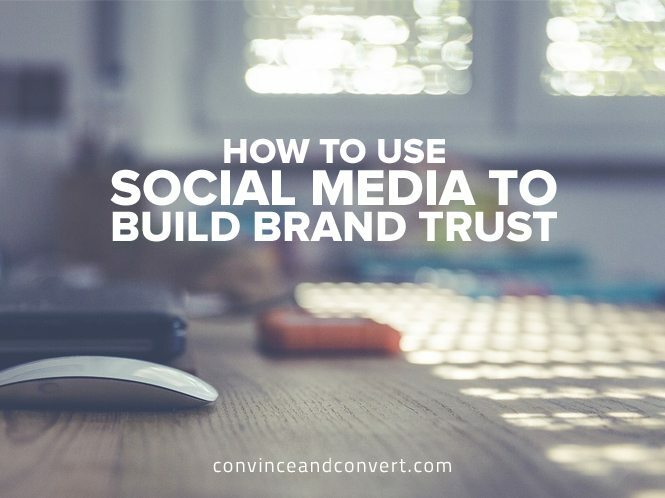 While building a community and brand trust is a major advantage of social media, it’s also a great medium for promoting your content, products, and services. You just have to do it the right way. For starters, the majority of your tweets should be building up your trust score—being an authoritative commentator, being helpful, and creating that intimacy. Looking at your social feed is a great way to see how self-promotional you’re being. Are the majority of your tweets promoting your own content or products? Or are you interacting with followers and sharing third-party articles? While they’re promoting their own content, they make it fun. They include a quirky animated GIF or emojis to show their playfulness. In addition, rather than saying “New post! 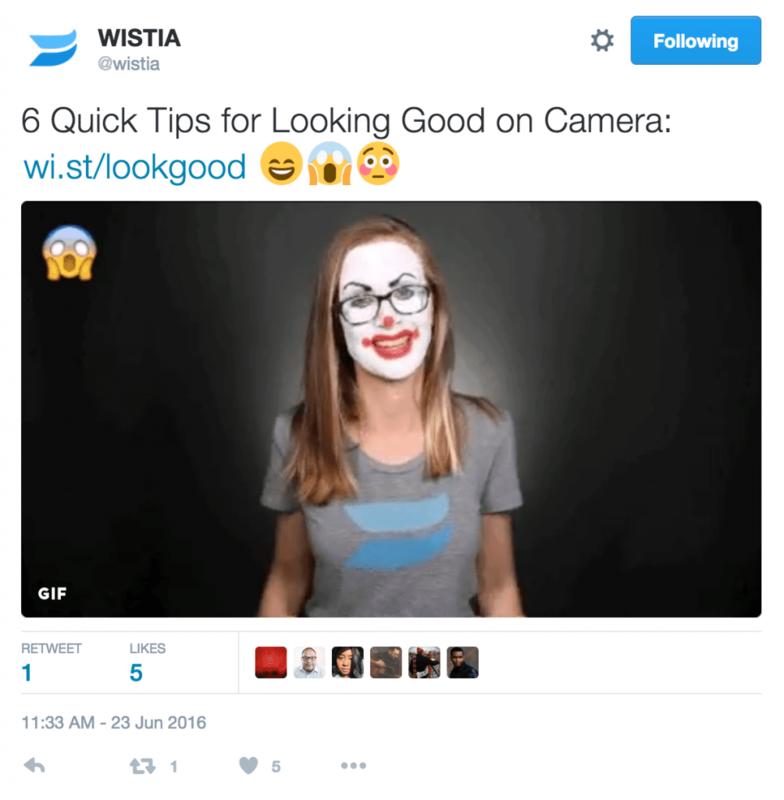 Check it out!,” the tweet clearly states the benefit the follower will receive by reading the post—how to look great on camera. Lauren Smith is a Boston-area content strategist who has written hundreds of posts and reports on email marketing and design. She’s passionate about creating great subscriber experiences and helping the world send better emails. Lauren currently heads content marketing at Litmus, a web-based email creation, testing, and analytics company. In her spare time, she enjoys trying out new recipes, traveling, and debating the Oxford comma.